Walk into the New Berlin Public Library or Watertown Public Library on a particular night and you might just find Bo, Chloe, Marco, or Goliath stretched out on the floor in the children’s area, tails wagging, listening to a child read them a book. No, people aren’t sneaking in their pets. This is part of each library’s therapy dog reading program, in which kids have the opportunity to read aloud to trained therapy dogs, thus building important literacy and social skills. The children choose the books they want to read and spend 15 minutes or more reading with a canine companion. By providing quiet comfort, the therapy dogs transform into supportive reading buddies and trusted friends in a safe and welcoming space. This February, the libraries in Jefferson and Waukesha counties have been asking their communities “How has the library transformed your life?” through a month-long Libraries Transform campaign. This one question has generated fascinating answers that exemplify how transformative libraries can be: “I can find a list of jobs and homes for rent online.” “It gives me a chance to be more involved in my community.” “I can self-improve, travel, learn, and relax for free.” “I learned to make quiche.” And at therapy dog reading programs, libraries transform kids into confident readers. Kids aren’t the only ones who benefit from this program. A woman with a speech impediment has come in to New Berlin Public Library to practice with the therapy dogs, as did someone trying to improve her English. 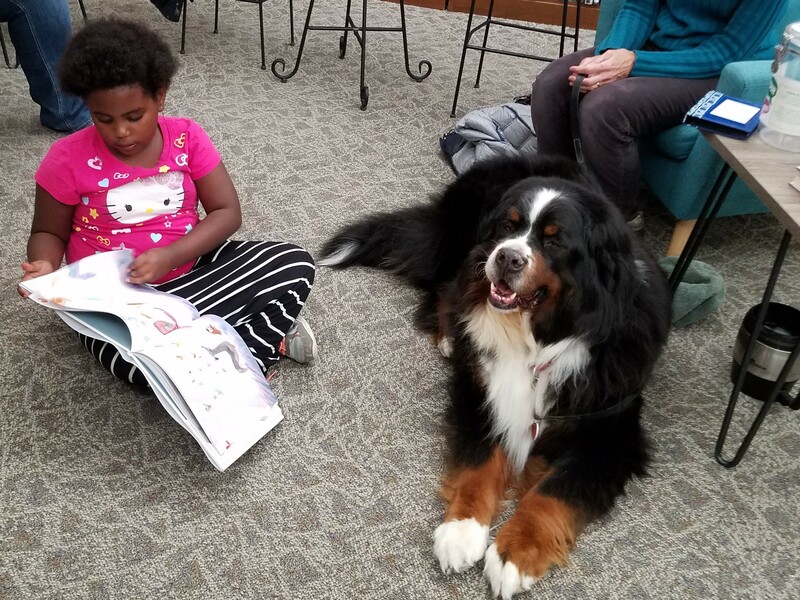 More libraries in Waukesha and Jefferson counties are recognizing the importance of these special canine reading programs too. The Dwight Foster Public Library in Fort Atkinson, Hartland Public Library, Delafield Public Library, the L.D. Fargo Library in Lake Mills, and others offer similar reading programs, offering a unique opportunity for budding or struggling readers to transform into confident kids. Find dates for the Read to Rover program on New Berlin Public Library’s Event Calendar at www.newberlinlibrary.org/calendar. Find future dates for Watertown Public Library’s Reading with Rover program at http://watertownpubliclibrary.evanced.info/signup/Calendar.